The LS-9101 is an 8-Slot 10 MCU chassis designed for Positive Train Control. Designed in accordance with AAR S-9101 Section 8.3, this chassis is sturdy, efficient, and designed to support your most demanding rail applications. 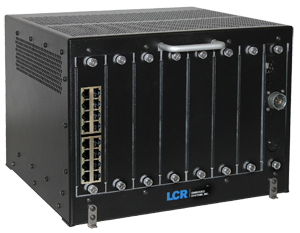 The LS-9101 platform uses the Association of American Railroads’ (AAR) Ancillary Card Cage form factor and can be used to support Communications-Based and Positive Train Control, as well as video storage and cell modem applications. The 8-slot platform has one master slot and seven application slots, which are connected to one another via a robust Dual Star fabric, and the power supply card can be placed in any application slot.